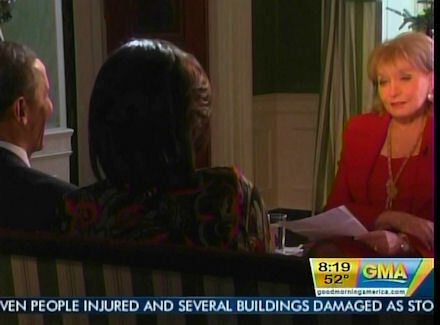 Barbara Walters' Slobbering Interview With Obama: What Super Power Do You Want? To the First Lady, the journalist posed a question about reincarnation: "If you were to die and come back as a person or a thing, what would you want it to be?" This appeared to be too much for Mrs. Obama, she interrupted, "Oh, God, Barbara." The fawning piece was teased on Friday's "Good Morning America" and Monday's "The View." It included queries on the romantic life of the couple. On Friday, Walters enthused, "I'm looking at you. You're holding hands. That's very sweet. How many years married?" She followed up, "And [you] still hold hands." BARBARA WALTERS: The President asks that people stay hopeful, that better days are coming, that they have a President who is thinking about them every day. Mrs. Obama says the holidays are a time to reach out to family and friends with an open heart, to find forgiveness where it's needed. And that caring for the health and well-being of children of the next generation for her and for most people, is the most important thing. Could White House press secretary Jay Carney have done any better? On Monday's "View," Walters played this clip: "We asked middle school and high school students to throw a few questions. I'd like to read their questions. If you were a super hero and you could have one super power, what would it be?" The President relayed that he'd like to be able to fly. ROBIN ROBERTS: In their only joint interview of the year, President and Mrs. Obama, sat down with our Barbara Walters for a 20/20 that you can see tonight at 10pm eastern time here on ABC. And it's one of the first couple's most revealing and truly warm interviews yet. And Barbara's going to give us a little bit of a sneak peek here. BARBARA WALTERS: First of all, happy holidays and a wonderful year ahead, my dear Robin. ROBERTS: To you as well. I'm looking forward to it. You are wonderful. WALTERS: Thank you, Darling. So, I've interviewed the Obamas now for three years in a row. It's almost a tradition, at least for me. And it's very rare that they sit down together. And they're quite different when they do. What I did this time, in addition to serious questions, was borrow from Vanity Fair's questionnaire, you know where they ask personal things. And, as you can see, they're somewhat different when they're together. Okay? WALTERS: When I interviewed you after the 2008 election, you said, about the First Lady, she is my reality check. She knocks me down a few pegs. Mrs. Obama, how does one knock down the President a few pegs? MICHELLE OBAMA: No one knocks him down. MICHELLE OBAMA: But I tease him a lot. MICHELLE OBAMA: Any and everything. WALTERS: Oh, you don't like his ears? MICHELLE OBAMA: Oh, yeah. His dancing. His singing. BARACK OBAMA: My dancing. My singing. MICHELLE OBAMA: He's fun to tease. The girls love to do it, too. BARACK OBAMA: I'm basically the straight man from the Obama family. WALTERS: What's the trait you most deplore in yourself and the trait you most deplore in others? BARACK OBAMA: You know, it's interesting. There is a deep down, underneath all of the work I do, I think there's a laziness in me. I mean, it's probably from growing up in Hawaii. It's sunny outside, sitting on the beach. WALTERS: Sounds good to me. BARACK OBAMA: Right. And the thing, actually, that I most dislike is cruelty. I can't stand cruel people. MICHELLE OBAMA: I would say when people are unwilling to compromise. And I don't like it when I see that in myself. MICHELLE OBAMA: Oh, God, Barbara. WALTERS: Wait, wait, wait. Well, it's going to happen. If you were to die and come back as a person or a thing, what would you want it to be? MICHELLE OBAMA: I know what it is. MICHELLE OBAMA: I would want to be Bo. WALTERS: I knew you were going to say that. MICHELLE OBAMA: How did you know that? WALTERS: 'Cause I know you adore Bo and because he's so cute. MICHELLE OBAMA: He has got a great life. WALTERS: Okay, you want to come back as Bo. You want to come back as your own dog. MICHELLE OBAMA: He has got it good. And only Bo. Not a dog. But Bo. WALTERS: Because he has got the best life. MICHELLE OBAMA: Oh, God. He's got it good. WALTERS: What would you like to be? BARACK OBAMA: People do love Bo. MICHELLE OBAMA: Oh, my goodness. WALTERS: I'm looking at you. You're holding hands. That's very sweet. How many years married? BARACK OBAMA: 20 next year. MICHELLE OBAMA: Right. Well done. WALTERS: And still hold hands? MICHELLE OBAMA: Yeah. He's very affectionate. WALTERS: Bo is everywhere in the White House. I've never seen it more beautifully decorated. And it's for gold star- on the trees and everything. It's for gold star parents who have lost a loved one in the war and blue star, where they have children still serving. But wherever you look, there are pictures and statues and felts and candy. All Bo. Bo, Bo, Bo. ROBERTS: Even the President took Bo shopping. WALTERS: Exactly. That's the luckiest, happiest dog. ROBERTS: It's a lucky dog. So, you did this interview right before they left for Hawaii. WALTERS: Well, they were all supposed to go together. And then, of course, the President had to stay here. But, when Mrs. Obama talked about compromise, she doesn't like people who don't compromise, there was a little something in there. And of course, a compromise has now been made. WALTERS: Their message. Well, let me read it to you. WALTERS: They were each quite different. You know, he's speaking as the President. And she's speaking as the First Lady. So, let me find it. [Walters' earring falls off.] Whoops. I just lost an earring, but that doesn't matter. The President asks that people stay hopeful, that better days are coming, that they have a President who is thinking about them every day. Mrs. Obama says the holidays are a time to reach out to family and friends with an open heart, to find forgiveness where it's needed. And that caring for the health and well-being of children of the next generation for her and for most people, is the most important thing. WALTERS: So, it was lovely spending Christmas at the White House. ROBERTS: You're starting a look here with the one earring. You're so hip. ROBERTS: But, that's how the kids are wearing it today. Just the one earring. WALTERS: You mean, I'm finally with it? ROBERTS: You've always been with it. Barbara, bless you, thank you and we will be watching tonight.